Have you ever wondered what items get donated to archives? Well now’s your chance to find out! There might be some surprises in store for you in the meeting room at WGC library on Saturday 16th, between 10am – 3pm. In addition to seeing old maps, photographs, newspapers, booklets, adverts or posters, you might see a Skarsten scraper… or a set of Eyelure artificial eyelashes, complete with tubes of original fixative; some Cresta silk samples and clothes hangers… how about a carrier bag from the Welwyn Department Stores? Might you even have similar items lurking at the back of your own loft or garage?! You’ll never know unless you come along. See material on display from the WGC Library Local Studies Collection, The Welwyn Garden City Heritage Trust archive and local photographer Ken Wright’s personal archive. 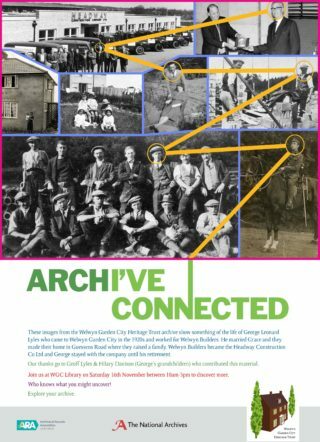 Do support this one-day event being put on as part of the first ever National Archives week encouraging people to discover the stories, the facts, the places and the people that are at the heart of our communities. Archives across the UK and Ireland are taking part to raise awareness of the value of archives to society and of the rich variety of content that is held, preserved and made available to users. Looking out for a former THE SHREDDED WHEAT FACTORY employee from the 70s. Where can I find those files to search!? At Hertfordshire Archives & Local Studies, we photos (not yet catalogued) and staff magazines from Shredded Wheat. Thank you for putting on this fascinating event. So much of great interest, including the superb photographs.